Tahiti Dance Fitness (TDF) is Singapore’s first Tahitian dance and exercise studio focussed on the vibrant and diverse moves from the French Polynesian dance, an exercise initiative brought over in 2009 by Tahitian sisters, Lila Evrard and Beatrice Heitiare Caisson. Between them, the sisters have over 35 years of experience in teaching and performing the traditional ote’a dance, which has driven them to share this healthy and happy art form with the city. TDF offers fitness classes three times a week for women and girls, and at lunch time for the CBD crowd working close by; it also conducts private workshops for corporate groups and stages performances. Our 120-minute workout with Caisson commences with a Tahiti Fitness element that continues into the Tahiti Dance class, which comes next. To dance the part, you’ve got to dress the part – everyone who attends the class has to don a wrap-around sarong-like skirt called the pareo in Tahitian (but bring your own top). We start off with the basic hip movements, using Tahitian dance terms like ami and tamau – the former sees us drawing large circles with our hips, and the latter is a gentle side-to-side motion. As we fa’arapu by engaging our hips in a series of small fast rotations, we’re reminded of Taihitian dances’ principles of keeping the feet grounded, knees bent and abs engaged, while isolating the shoulders and chest. After a good hour of warm ups, we jump into a choreographed sequence, danced to a combination of slow dance aparima and faster ote’a music. Executing the different hip movements requires much focus and coordination for the unacquainted, and the burn works its way from the feet up to the thighs and calves. The rocking of the hips requires you to stand on your tiptoes and maintain your balance as you dance to the music. Caisson also touts the self-confidence aspects of the dance – given that all of its classes are for women only, the sessions provide a safe space for participants to unleash their graceful, feminine sides without feeling too self-conscious. 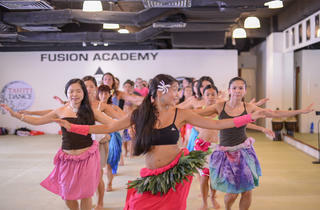 Caisson hypes the studio in true Tahitian spirit with her constant beaming and positive energy. ‘I want to share the culture of my people and the dance that I love so much with others. I love seeing people happy and having fun.’ With a motto so simple and cheerful, this class is a great way to experience a little piece of Tahiti on our sunny shores.